About 2 years ago, I stopped using Windows on my main computers at work and home. I switched to a Mac Mini, then to a Macbook, for all of my daily work, web design, programming, photo organizing, etc. We also have a large install base of Ubuntu Linux machines and a few Windows 2000 boxes at work, so I didn’t use OS X exclusively, just whenever possible. Then, about two months ago, I switched to using a new Dell with Ubuntu Linux at work. For the most part, I couldn’t be happier, but there are a few things I really miss about my Mac. Here’s a list of the 10 things I miss the most. If you know of replacements for any of these under Ubuntu, please leave a comment and share your solution. When I first upgraded to OS X Tiger, I thought the Dashboard was silly and a waste of processing power. After almost two years, it became the thing I instantly missed the most when using Ubuntu. With a selection of Dashboard widgets including clocks displaying multiple time-zones, the weather, system stats, and website stats, the Dashboard can become quite addicting. When using Ubuntu, I keep wanting to press F12 to check my widgets, but I haven’t found a good desktop widget solution for Ubuntu yet. I love Quicksilver on the Mac for quickly launching apps and doing repetitive tasks. I can’t use a Mac without Quicksilver because digging through the Finder to launch something like the Activity Monitor drives me nuts. I’ve only scratched the surface of what Quicksilver can do, but I can’t find anything on Ubuntu that does these tasks quite as well. I’ve tried Deskbar but find it slow and annoying. Is there something out there that compares with Quicksilver on Ubuntu? Adium is simply the best chat client I’ve ever used. Because it is based off the same messaging library as Pidgin (GAIM), it supports just about ever IM network out there. The interface, however, is much nicer than Pidgin’s interface and integrates perfectly with OS X. When Using GAIM on Ubuntu 7.04, I feel like I’ve stepped back 5 years. GAIM under Ubuntu is clunky and rather ugly. It’s also much more difficult to see when new messages arrive because there is no notification system similar to Aduim’s Growl based notices. The version of Pidgin shipping with the Ubuntu 7.10 looks more promising, hopefully it is more polished and fun to use. Yeah, I know, this is probably the number one complaint that everyone has about using Linux, but I’ve found it to be true - I can’t find any really great professional graphics software for Ubuntu. I know, GIMP is great, but I’m accustomed to using Adobe Fireworks for web design and site mockups, and GIMP just doesn’t fit my needs. Come on Adobe, start supporting Linux already! I spend a lot of time working in a text editor. 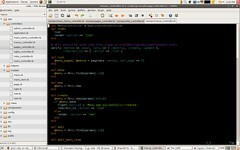 I got hooked on using TextMate for my web and Ruby on Rails work. It might not be the best text editor in the world, but it seems to be the best on the Mac. 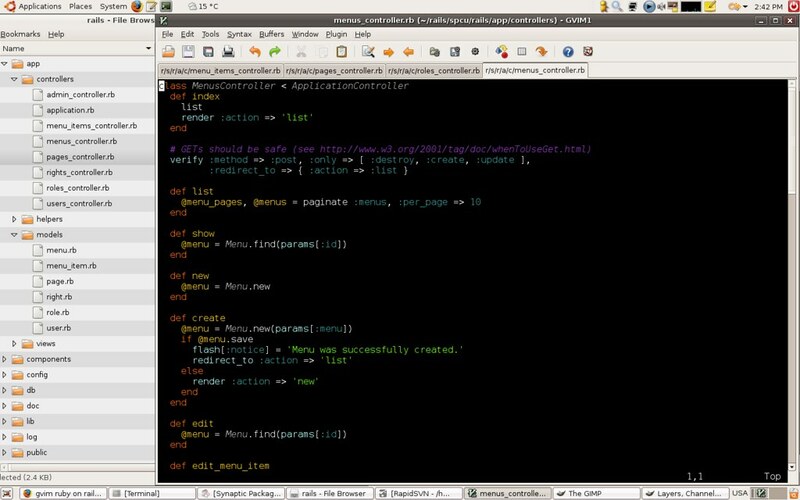 On Ubuntu, I’m using a combination of Gvim and Nautilus to replace TextMate. Gvim is fine, but I’m not yet a Vim expert and the lack of a good integrated file browser really bothers me. I think I’ll get over this one pretty soon. Mac OS has a great built-in dictionary application. I often find myself launching this app (with the help of Quicksilver) to check a word or find a good synonym. The high quality entries are from the Oxford American Dictionary. On Ubuntu, there is a dictionary application, but it can only look up words in free dictionaries (results and quality vary). This means that you must be online to look up a word, which is kind of a bummer. There are some cool features like multi-language dictionaries, but the quality often leaves much to be desired. Is there a really great dictionary app for Linux? Quicktime is one of those things that Mac users take for granted. It’s just there and it plays almost any media file you throw at it (especially if you’ve installed the Perian plugin). Playing your favorite media files on Ubuntu is not a great experience. Sure, if you hunt around the web enough, you find instructions on how to make just about any media file play in Linux, but the results are usually buggy. I often find it possible to play a file but not possible to fast forward or rewind without the player crashing. I miss Quicktime and its simplicity. Bluetooth support in OS X is simple and easy to use. I have a mobile phone with Bluetooth and it only took me a few minutes to pair it with my Mac and start syncing files. A few minutes later, I was using the phone as a mobile modem that can connect my Macbook to the net while on the road. Transferring files to and from devices like mobile phones and the Nokia N800 is also a breeze. While I was able to get rudimentary file transfers working with the Bluetooth module in my Dell N1420, it was not easy. Syncing contacts and calendars also seems to be impossible. Much work could be done to improve the Bluetooth experience in Ubuntu. Mac OS X has system-wide spell checking for all Cocoa based apps. This means you can have just about everything you type into your Mac spell checked. This unified system means that you only have to train one dictionary with your new words. Of course there is spell checking in almost every Ubuntu application, but each one has its own system. You need to train the dictionaries for each app and get used to each system’s little quirks. Hopefully, someone out there is working on a system-wide spell checking framework for Linux. I prefer to use an external mouse instead of a notebook’s trackpad, but if I have to use one, I want it to behave itself and be easy to use. Apple’s implementation of the trackpad is simply brilliant. You can customize the trackpad to ignore accidental clicks, use two-finger scrolling, and the all-so-cool two-finger “right click”. After using a Macbook for over a year, the trackpad included with my Dell Ubuntu system seems horrible. First of all, the scrolling feature of the trackpad doesn’t work at all. What’s even worse is the lack of a setting (that I can find) to make the trackpad ignore accidental taps. I’m constantly having the cursor jump to another spot on the screen because I accidentally tapped the trackpad with my palm while typing. I’m really hoping that Ubuntu 7.10 addresses some of these issues. Overall, I have to say that I’m very happy with using Ubuntu. These are just a few little things that really bug me about my Dell Ubuntu notebook. With a little patients, I’m sure most of these issues will be solved. There are also a lot of things I love about Ubuntu that I miss when I use OS X, maybe I’ll share those in my next post.